This article will tell how to extend disk volume space on Windows Server 2008 when "Extend Volume" option under Disk Management is greyed out. Download IM-Magic Partition Resizer Server to extend disk partition (C drive, primary partition or boot partition) when "Extend Volume" is greyed out on Server 2008. Windows Server 2008 Disk Management has improved its functions, which enables users to extend disk volume and shrink disk volume easily. However, at most time, you may find that the "Extend Volume" option is greyed out. The reason why this option is greyed out is that there is no contiguous unallocated space right behind the partition you want to extend. In this situation, you have to move the unallocated space close to the partition you want to extend or you need to rely on third-party partition software IM-Magic Partition Resizer Server to resize disk partition on Windows Server 2008. 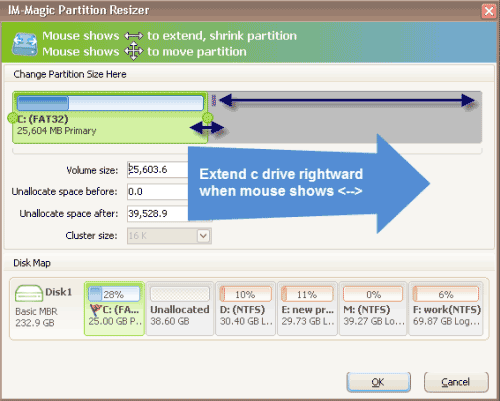 Download, install and run IM-Magic Partition Resizer Server on your PC. Right click a partition that has lots of free space and go to "Resize/Move". You can move the arrows to squeeze free space on the selected partition. Then, you can see some unallocated space, which will be located beside the selected partition. You need to move the unallocated space close to the volume you want to extend and then right click this volume and go to "Resize/Move" option. Move the arrows to add the unallocated space to the selected volume. Finally, you need to click "Apply" button to apply all pending operations. It is difficult to extend disk volume on Windows Server 2003 without third-party partition software, because Windows built-in Disk Management doesn't have the function of resizing disk partition. Windows Diskpart can extend a partition on Server 2003, but it is complex to handle and it has many limitations. Therefore, Windows Server 2008 has improved its functions and enables its users to resize disk partition on Disk Management. You only need to open the Disk Management and right click the volume you want to extend, and then you can choose "Extend Volume" option to get the selected volume extended. "The Extend Volume option is greyed out when I right click C drive on Disk Management in Windows 2008. I l learned that unallocated space is needed in order to extend a disk volume, so I right click D drive and shrink the volume to generate some unallocated space. However, the Extend Volume is still greyed out when I right click C drive. What is wrong with it? How can I extend the C drive on Windows 2008 when Disk Management cannot extend the volume?" "Hello! I was unable to extend the disk volume on my Windows Server 2008 PC, because Extend Volume option is greyed out. Is there any other way to extend disk volume on Server 2008? I don't want to repartition or reformat the hard disk." Right click a volume you want to extend, but you find that the "Extend Volume" option is greyed out. What is wrong? Can you extend the disk volume? If you want to extend a volume, you should make sure there is unallocated space on the same hard disk. If there is no unallocated space, you can generate some from other partitions that have lots of free space. You just need to right click a partition and select "Shrink Volume" option. Them, you can see some unallocated space behind the partition you shrink. Usually, the unallocated space will display behind the volume you shrink. If you want to extend a volume, you still need to move the unallocated space close to the volume you want to extend. However, Disk Management cannot move a partition. 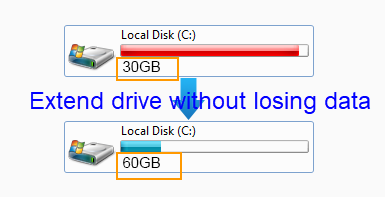 For instance, you shrink D drive to produce some unallocated space. If you want to extend C drive after shrinking D drive, you need to delete D drive so as to move the unallocated space close to C drive. Otherwise, the "Extend Volume" option will be greyed out. Apart from Disk Management, third-party partition software also makes it easy to extend disk volume on Windows Server 2008. You can use IM-Magic Partition Resizer Server to extend system partition on Windows 2008, extend C drive without reinstalling system and resize disk partition without formatting. In a word, IM-Magic Partition Resizer Server enables you to extend disk volume on Windows Server 2008 without any limitation. You can resize the disk partition without losing any data or rebooting your computer.